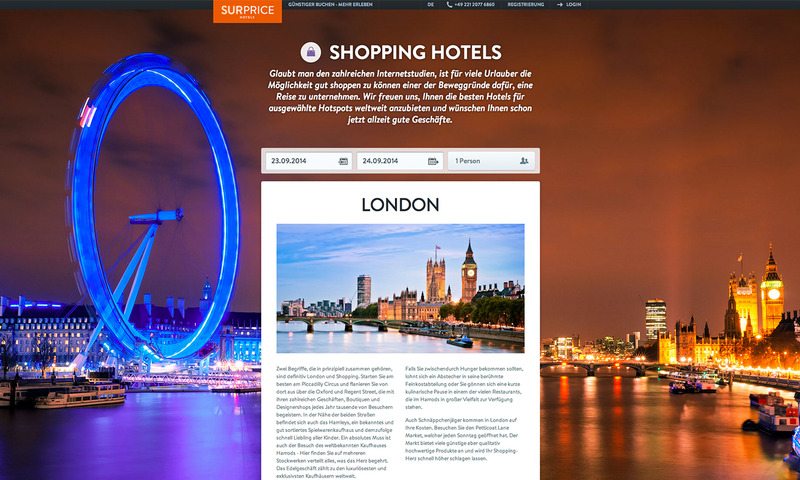 SURPRICE Hotels is a worldwide hotel booking portal based on the blind booking principle for experience-oriented and price-conscious travellers. In close cooperation with the client we designed and came up with a concept for the portal, which was developed using a tablet and mobile-first approach. The most important aspect in the design phase was the question: how can we still convey a sense of trust to the customers, who, due to the blind booking principle, only find out the name of the hotel after they have made their booking, as well as giving them a feeling of security? 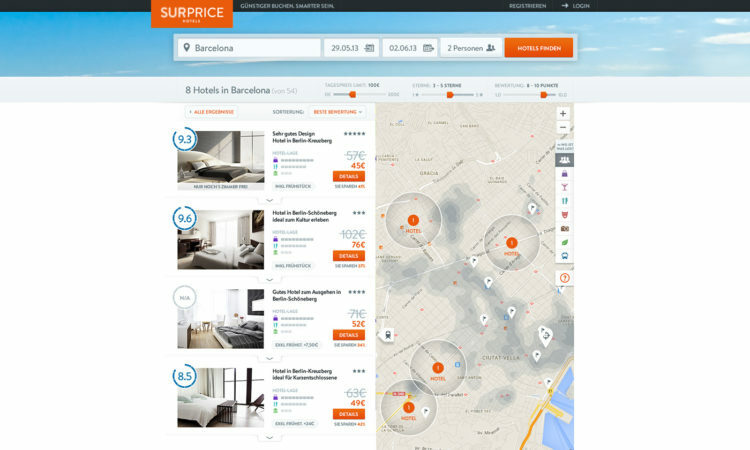 We understood this as an integral design task – starting with the display of the prices, the hotel details and the search down to the check-out process and the information about the company itself. The search results list is the central interface in the user navigation of the hotel bookings. This is where all of the relevant information has to be pooled. 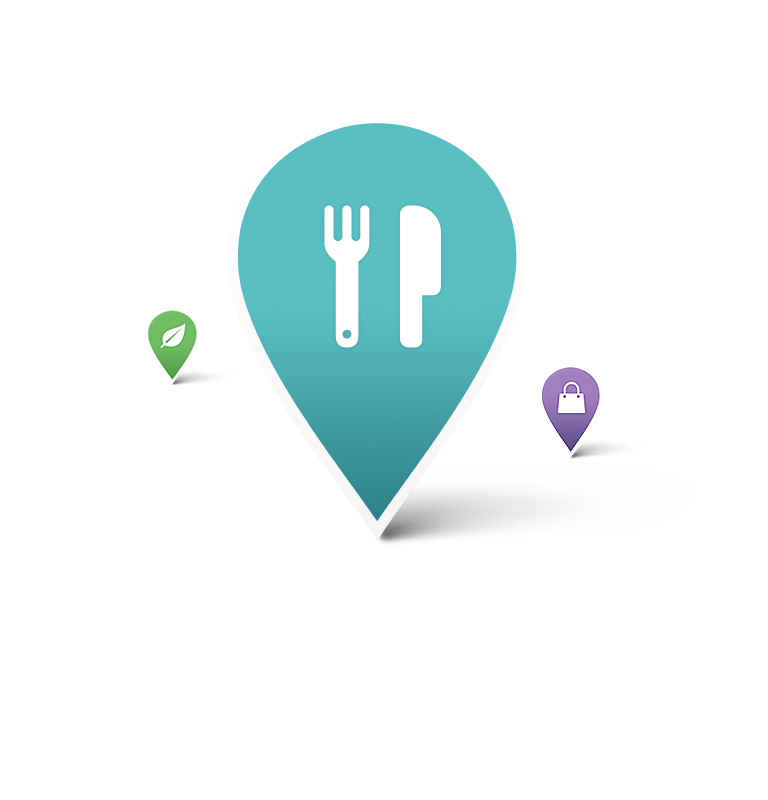 A well-thought out interaction between the map and the list is important and the core of the website. 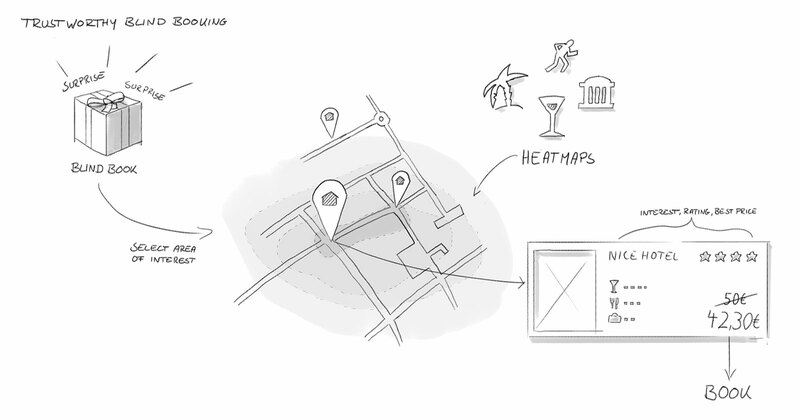 Thanks to descriptive maps of the surrounding areas and a categorisation of activities, which can be displayed via ‘heat maps’, together with the client we designed a brand new approach for the hotel selection. Numerous photos convey a good impression of the atmosphere and the style of the hotels. The clear rating display by the four big online booking and rating portals HRS, hotel.de, HolidayCheck and TrustYou add additional security. 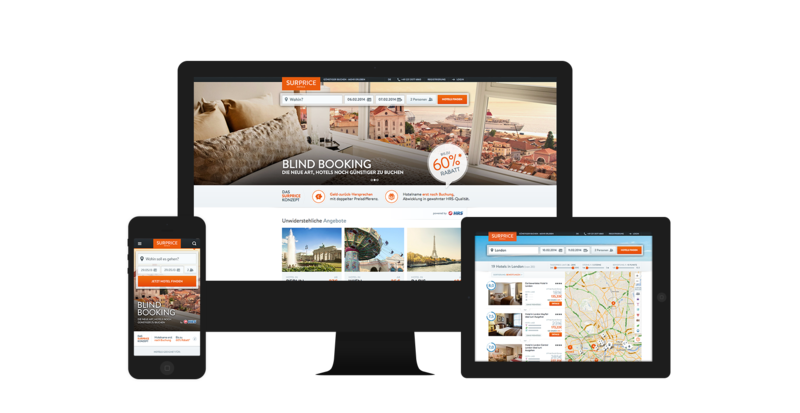 In addition to the added benefits during the booking process, in the design we ensured that the page design wasn’t too unemotional. 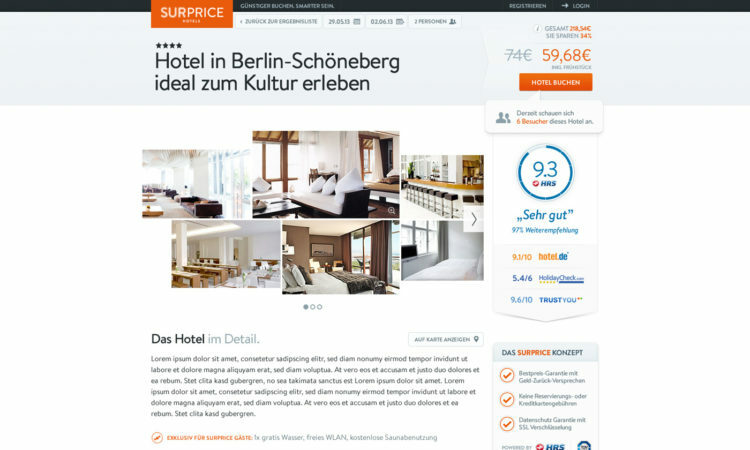 Prominently displayed price discounts that support the positive feeling that the user is saving money are just as much a part of this as emotive images and smooth-functioning interaction processes. A good visual presence is the first step towards a relationship between the user and the service. Throughout the entire UX process there are supporting explanations. Whether an explanation of the blind bookings at the start of the page or later within the overall context, such as on the search results page. 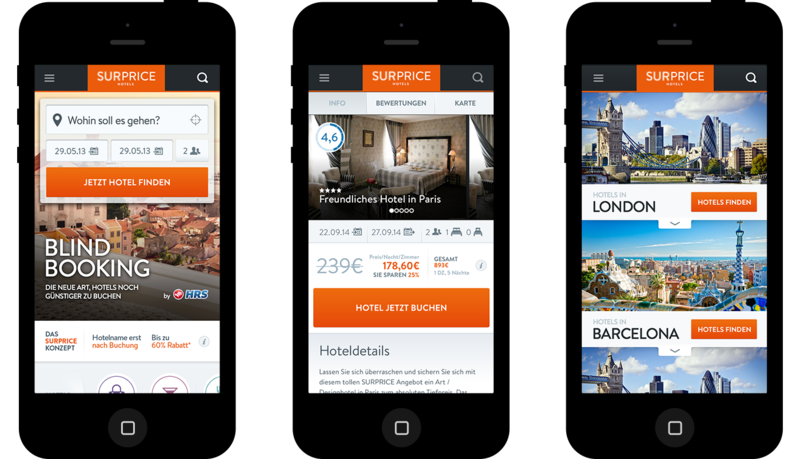 Conversion-optimised booking steps and a high-quality design are not mutually exclusive. With a good selection of images, a straight-forward user navigation and meticulously compiled lists, every e-commerce process can become an enjoyable experience.